Udaleku is quite an undertaking, but it is not necessary to reinvent the wheel. The hope is that the following--not set in stone but adaptable--will be of assistance to organizers in putting together a successful camp. 1. MUSIC. Every student must make an attempt at learning, or improving, on either the accordion or txistu. 2. DANCE. Every student will be expected to participate in dance rehearsals and make an attempt to learn as many of the dances as possible. 3. SINGING. Participants will take part in singing sessions in which both old and new, northern and southern, Basque songs will be learned. 4. LANGUAGE. 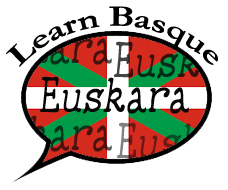 This being a Basque camp, "Euskara" or the Basque language should be present and apparent. No one can learn the language in two weeks, but an effort should be made to introduce the language. 5. PILOTA/PALA. When possible, camp seeks to teach the basics of Basque handball and/or pala to s6erve as an inspiration for future playing of the sport[s]. 6. CULTURE. Participants should be exposed to relevant cultural and historical topics to develop their Basque cultural literacy about the Homeland and the diaspora. 7. GROUPS. All the participants will be divided up into seven groups, one for each of the seven Basque provinces (If nothing else, some will learn that there are seven provinces). The function of these groups is to better organize the camp and coordinate instruction and the important item--clean up duties. 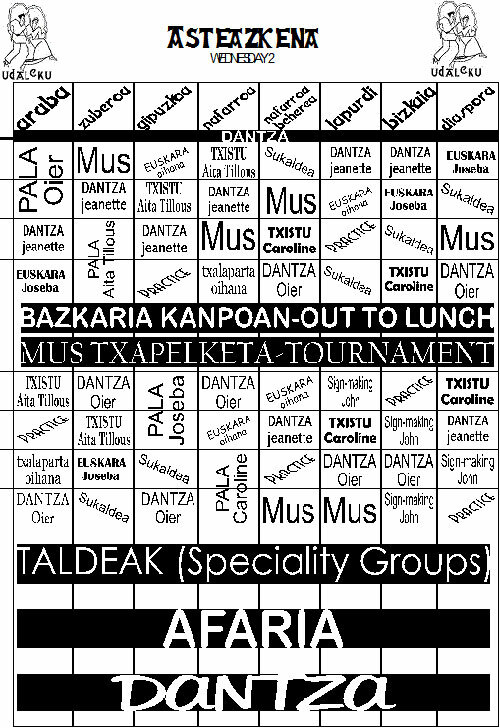 The groups, each coordinated by a music/dance instructor, would aim to accomplish the following: Mus & pala instruction; Euskara; cooking, tambourine, and their group/province presentation. DANTZAK: Dancing. The dancing instruction should be broken down by boys, girls and mixed. A further breakdown should be made based on the abilities of each student. Every student is expected to dance. The students should learn from 2-5 dances, if possible, and receive some finer points on some of the dances they already know. The daily schedule should have at least two 2 sessions of about 45 minutes each. ABESTIAK: Singing. Participants will take part in all singing sessions, consisting of popular and traditional Basque songs. Approximately one hour each day should be allotted. The atmosphere is best shifted from formal (all seated or standing together) to informal (after a dinner). NABO provides the song booklets (prepared beforehand) that are theirs to keep if they would like. ESKU SOINUA: Accordion. Classes are not to teach students how to play, but to teach them Basque pieces. Depending on the number, classes should be divided between beginners and intermediate, of twenty-five (25) minutes each, at least three times a day. The instructor can decide how best to teach the material. Accordions are not provided by NABO. 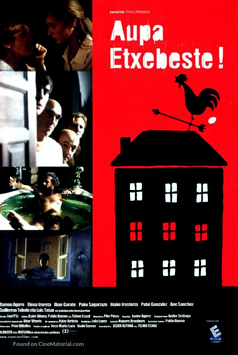 TXISTU. Classes are to teach students how to play the instrument, and to teach Basque pieces. There will be beginning and intermediate groups, taught in twenty-five (25) minute sessions, at least three times a day. NABO encourages students to bring their own txistu, but provides them with one if they need. MUS. Classes should consist of 25 minute sessions, two or three given to instruction. Afterward, the students can play on their own with the instructor(s) supervising and helping with the scoring. By the second week, a tournament will be arranged. PALA/PILOTA. If the camp site has access to a fronton, students may learn the basics of the game of "pala." The first session should be for instruction, then afterward the students can play on their own with the instructor(s) supervising and helping with the scoring. By the second week, a tournament will be arranged. CULTURA. Students are introduced to a topic through a brief presentation and then are led in a related activity to help them internalize the material. EUSKARA: Basque. Classes are not intended to do the impossible: teach Basque in two weeks. The aim is to introduce the language to those who vaguely remember it and even to those who hear it at home. Basically, if this is a "Basque Music Camp," the language must be made apparent. Instruction of dance and music should be in Basque whenever possible. Several twenty-five sessions aspire to encourage students to pursue learning the language. SUKALDARITZA: Cooking. Classes are both practical and beneficial. Students in their groups should take turns learning some simple cooking techniques (for example preparing "tortilla," "paella," "arain salda," and "gateau basque") to take home with them and also to help with the meals during the camp. PANDARETA: Tambourine. In their groups, students would learn some basic playing techniques of the "pandareta" or tambourine to accompany the accordion. The twenty-five minute sessions can also be used to sneak in some extra singing practice. The tambourines need to be purchased before hand (at least seven), and they can be sold after the camp if a new supply can be obtained for the next year. PRAKTIKATU: Practicing Music. Some sessions can be set aside for each provincial group, outside of formal instruction, to practice the pieces that they have been given. These sessions need to be monitored by one of the instructors. TALDEAK: Group/Province. Each group, headed by one of the instructors, prepares an informative or entertaining presentation on some element of Basque history or culture to present to the rest of the group. Several meetings will be scheduled prior to the presentations during the second week. This outline is for a camp of fifty students, and it includes six dance teachers (three female, and three male) who can share the secondary activities and perhaps also help the music instructors. (If there are fewer, then perhaps only four dance instructors will be needed; consequently more may be needed if the group exceeds fifty.) At least seven of the instructors will also be leaders for each of the provincial groups (for the seven Basque provinces). Instructors should be present at the camp at all times to help with whatever may arise. The internal director should see that each is rotated around to allow for a few breaks from instruction (see appendix for the staff planning schedule). Dancing will be coordinated by a male and a female dance director, who together plan the dances that will be taught and performed. Music instruction will be decided upon by the music instructors in consultation with the internal director. Instructors will receive a minimum salary of $300 (as of Jan. 1991) and most travel expenses. Paralleling the varied club composition of the participants, an effort will be made to attract instructors from throughout the American West, and to rotate the positions so that many may have an opportunity to instruct if they are able. The external director will assemble local help to assist with meal preparation. Cooks should be able to be recruited from the membership of the host club. Supplies can be purchased ahead of time and only the perishables purchased daily, coordinated by the external director. Cooks would prepare the meals either on site or at home. The set-up and clean-up can be handled by the students in their provincial groups. With students staying in the homes, we have abolished the previous positions of day and night supervisors. The internal director shall serve to handle emergencies, sick students, and any questions that may arise. For some events or excursions, the external director may want to secure some chaperones. If the students are housed in one place, the external director should assemble different volunteers from the local club who would be willing to stay the night on site. This schedule should be divided among the NABO Music Camp Chairperson, and the two directors. _____ Confirm dates and host(s) of the camp. _____ Prepare tentative budget including enrollment totals and cost per student. _____ Apply for possible grants. _____ Confirm prepared budget and determine per student cost. _____ Print necessary registration forms and letters and prepare for mailing to clubs. _____ Follow up on grants. _____ Confirm housing & transportation. _____ Re-confirm instructors and staff. _____ Evaluate enrollment results/more mailings/phone/etc. _____ Have instructor/staff meeting on what duties include. _____ Confirm most all meals. _____ Confirm housing and transportation. Each of the participants will be placed in one of the seven provincial groups (Araba, Benafarroa, Bizkaia, Gipuzkoa, Lapurdi, Nafarroa & Zuberoa) by the level of their musical ability. Each group should number from four to eight students, headed by one of the instructors. On a rotating schedule from meal to meal, group responsibilities include set-up and clean-up. They can also be used for quick attendance checks. Finally, each prepares a presentation that will be given to the other group (and invited host families and quests) by the middle of the second week. In their groups, students will attend their classes throughout the day. Music classes will last twenty-five (25) minutes with a five minute break to switch. This schedule takes advantage of shortened attention spans. Dance and singing sessions will be held all together, for a longer period of time. The daily schedule, put together by the internal director with suggestions from the staff, will vary from day to day, and it will be broken up with meals, free-time, and fun activities (see appendix). The host club(s) is welcomed to arrange some fun events that may include: volleyball, swimming & water parks, City Tour, movies, quest speakers, excursions, bowling, softball and going out to eat. At the conclusion of camp, an evaluation should be distributed to the participants and instructors so to better evaluate the whole camp and forward future recommendations. NABO has previously recommended that Udaleku participants be housed in one place when possible, but the problem now is that we do not have the funding to make up the difference. The present fee of $220 (Jan. 1991) is enough to only cover the camp's expenses (supplies, salaries, fun activities, and food) minus lodging. The dormitory concept, which has its benefits, would entail an increased fee. Perhaps soon, NABO may acquire the necessary funds to support the option of combined housing. In the interim, students will need to be housed in host homes. The external director should make the necessary arrangements for housing and transportation to and from the camp site. With students staying in the homes, an effort should be made to lessen the housing burden on the hosts whenever possible (they are asked to provide a bed, only 2 or 3 meals, and to do a couple of loads of laundry, and perhaps help with transportation). Most all meals will be provided by the camp; some nights, however, can be set aside as "family nights" for the kids to enjoy with their host families. It is important that all the hosts know the hours of arrival and departure for each day. The internal director should make these announcements. Ideally the sites for the classes will all be in one place. The thing to keep in mind is need for numerous rooms which can be used simultaneously. The room for accordion instruction must be a locked room only for our use. The other rooms can be shared, and practice areas should be identified. Remember that carpet is not conducive to dancing. Plug-ins and extension cords are necessary for tape recorders in the dance areas. Many times an outdoor setting is appropriate for individual practice or even for an informal instructional period such as txistu or dancing. 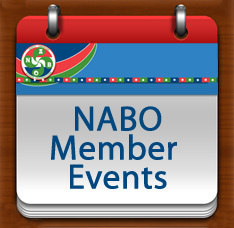 NOTE: NABO does not pick the host club—instead they step forward to volunteer as host. All expenses incurred for Udaleku will be paid by NABO with the money received from the participants. The host club(s) is not financially responsible for the camp, but any donations are gladly accepted. They are requested to assist with recreation, some travel, treats, cooking, etc. The seven instructors (minus the internal director/instructor) will each receive a base salary of $300. Because NABO no longer has a surplus of funds, Udaleku must be carefully budgeted to stay within the available money. Nothing can make the two-weeks more unendurable than a problem participant(s). The staff need not put up with this nuisance. The application/agreement packet includes a section that asks parents to accept responsibility for early dismissals of problem student(s). This step, if necessary, will follow an initial contact with the parent(s) and expulsion will be decided upon by the internal and external directors. The internal director shall make the general rules clear at the first meeting of camp. Discipline is important for at least three reasons: to allow the camp to progress, to save instructors headaches, and to preserve Udaleku's reputation. Because of this camp's nature, a few bad rumors can do much harm to future attendance if parents begin to believe that there are problems. For most parents to allow their little ones to attend, they need to know that the camp will be well supervised and structured. Stay with the planned schedule and be consistent. Most students quickly accept that this is how it is going to be, they adjust, and appreciate their free time more that way. 1. You will respect your hosting families. We are counting on you to be on your best behavior, and that your will make your hosting families happy to have opened their homes to you. 2. You will not take, borrow, or use anything from your hosts without asking permission. 3. You will not make telephone calls without permission. The Basque Center has a pay phone, so it might be a good idea to bring a pre-paid phone card to use. 4. You will not leave the house without permission, and without the host knowing where you are. They are responsible for you, and must know your whereabouts. 6. You will respect any rules the hosting family sets. 7. You will not make excessive noise in your host house. Most people will work during the day, and will not appreciate noise after a certain hours. 8. You will get up on time, and be ready to leave the house when needed. 9. You will have laundry done once a week. Please do not expect the hosting family to do laundry more than that. 10. Any misconduct will result in immediate dismissal from camp. Most all the meals should be served on site to help minimize cost and save funds for occasional outings to local eateries or Basque restaurant(s). The meals that are the simplest seem to go over better than the large sit-down dinner. Included is a list of foods and meals that have gone over well in the past. The suggested meals are also easy to prepare/serve and plan in advance. The utensils and plates should be paper and plastic. The students can serve themselves and do their own clean-up. Supplies can be purchased ahead of time and the daily responsibilities of the host club can be minimized. The students need the ability to fix their own meal and move on at that time of day. The availability as a base of cereals, milk, juice, fruit, and toast is advisable. Adding the following adds some variety: poptarts, donuts, waffles, pancakes, French toast, ham and eggs, and chorizos. Individual size packets are usually more expensive. The take-a-handful system works just fine, as does pouring your own drink. A refrigerator should be on site to accommodate the drinks and some treats or leftovers. Leave the menu planning flexible so that you can work around leftovers. Treats are always a favorite, but spread them out. Perhaps some can be donated by locals.